The zombie plague is going strong. All manner of creatures have succumb to the horrible disease, created by the Necromancers and spread through the bite of those affected. It would be truly horrible enough if it were just the humans dealing with the fallout, but orcs are also turning undead and going wild. And the plague is definitely not content with stopping there. But with the very survival of life itself on the line, it’s not just humans that are fighting back. Trusty companions of all kinds have taken up arms, looking to survive this awful time. The Friends and Foes and No Rest for the Wicked expansions for Zombicide: Green Horde bring all manner of new undead and new heroes to games of Zombicide: Black Plague. Let’s take a look at each and see just what new dangers and new opportunities are there for the Survivors. The Friends and Foes expansion brings a whole lot to the table. Starting out, there’s four new Survivors that players can choose. There’s Doran, the mage who specializes in Power Blast. Kabral the barbarian just loves sinking his axes into zombie flesh. Katelyn can slip in and out of zombie’s range, making well-placed jabs at weak spots. Then there’s Solveig, who’s skills with a Heavy Sword are almost unmatched. Joining them in their fight are six new Familiars, Gog and Magog, the large dogs, Seth and Vanadis, the winged cats, and Nucifer and Vatan, the wolves. All ready to send the zombies back to the land of the dead. They will have their work cut out for them, as the plague has mutated a new form of zombie, the Tainted zombie. They are covered in spikes and have acidic blood. When hit, they’ll flail around, trying to damage anything and everything in their vicinity. The new Survivors and their Familiar friends will have to fight against these horrors, including the new Tainted Abomination, across a 10-scenario adventure, utilizing the five new double-sided terrain tiles. No Rest for the Wicked takes the danger wrought by the zombie plague and turns it all the way up to 11. It is filled with new horrors the Survivors must confront. It might be easy to write off a zombie rat as nothing more than a nuisance. But when they band together, they form a whirlwind of claws, teeth, and nastiness that can quickly overwhelm one’s defenses. Fast and able to make use of any crack or crevice to get to their prey, it’s best to deal with them from afar. The zombie plague is not content with just the corporeal realm. Ghostly undead, the Spectral Walkers, show that the souls of the dead are not immune to its twisting and corrupting abilities. These zombies are only damaged by magic, as regular weapons simply pass right through them. A whole new strategy must be employed when taking them on. And then there’s possibly the most horrifying undead so far seen by the Survivors: the Zombie Dragon. This monstrous beast flies around on tattered, leathery wings, seeking out the living and spraying rotten bile from its decaying jaws. Its great bulk allows it to crush buildings and those inside, as well as makes it immune to only a certain type of weapon at a time. How will the Survivors ever hope to bring it down? Well, having a massive crossbow can help. The Ballista is intended to be used during sieges, but necessity has turned it into a zombie-slaying juggernaut. The huge bolts it hurls can go through multiple zombies, and even damage the Zombie Dragon. Utilizing it to its utmost is key to having Survivors stay Survivors. Survival is a struggle. And with all manner of new zombies constantly being created by the Necromancer’s plague, those that are alive will have to continue to adapt and stay one step ahead of the ravenous, hungry horde. These two expansions give players lots of new horrors to slay, as well as new tools with which to commit Zombicide on a scale never yet seen. 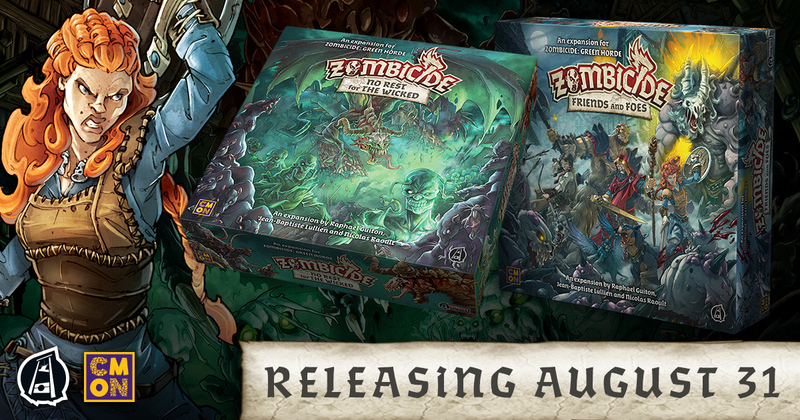 These new expansions for Zombicide: Green Horde will be in your FLGS on August 31.